Any tips for self study? I've been studying Koine Greek for the past 3 to 4 years and feel like I've plateaued. If I were to devote 1 hour a day to the study of Koine. How would you break up that hour. for example, would you spend 10 minutes reviewing vocabulary, 15 on syntax another 10 composing and 25 minutes reading. Re: Any tips for self study? I would suggest spending nearly all of your time reading. Read the Greek without using a translation except as a last resort. Study vocabulary and syntax as you encounter new vocabulary (or old vocabulary that you've forgotten) and syntactic difficulties. Look up every word you don't recognize in the dictionary, and make sure you know the grammatical form of every inflected word. Make sure you understand the syntax of every sentence you read. (Be prepared to recognize that in 2000-year-old texts there are necessarily going to be some passages whose meaning and syntactic analysis is disputed, and some passages that no one understands.) Equip yourself with a good commentaries that address linguistic, not just theological, issues. After three years you should have a handle on basic grammar and vocabulary. At this point, I recommend that you use reading to solidify your command of the language. Extensive reading, in my view, is the key to mastery of ancient languages (and modern ones, too, if you want to get beyond a basic competence). You might also try reading some classical Attic prose texts to broaden your command of the language--Lysias, Plato, maybe even Demosthenes and other Attic orators. I'm transitioning to the Schliemann method. Basically, you memorize a large chunk of text. More and more I think it is the only game in town for one hour a day. Of course if you were to be a full time classicist, then it would make sense to avail yourself of all kinds of secondary sources. But if your goal is to really get somewhere in a decade with only an hour a day, then reading aloud and memorizing is probably the way to go. I think one has to take very very very seriously the fact that people who know a dozen languages more or less all use this method. Imagine you live far from Russia and Russians. Now imagine you memorized 200 pages of Tolstoy. Lastly imagine what you would have to do with conventional methods to match the memorized Tolstoy. I agree you should spend most of the time reading, I think there's no doubt about that. Of course, I must slightly disagree on the particulars... I think you should read as much as you can so that you still understand everything. Commentaries, grammars, translations are necessary but they easily distract you from what's really essential, i.e. the Greek itself. Ideally, choose a text that's not too difficult for you, so you don't have to look up everything and so you can get immerged into the Greek. When you look up the translation, go back to the Greek text and make sure you understand - I think it's good to have a couple of different translations you can compare, so that you don't get the wrong idea of what the Greek really means. I think reading aloud and memorising slow you down, and are thus against my principle of "as much as possible" - a better variation of that in my opinion is reading again a text you've already read. Personnally, I finished reading the Agamemnon of Aeschylus recently, which I'm pretty proud about, since it was really really hard. Since then I've been reading a little Plato (Euthyphro and the Apology), which is much easier, I can read quite long sections without looking anything up if I don't feel like it. For improving my Greek it's much better than Aeschylus, because when I read without interruptions, I really get into the natural rhythm of the language. If in the same time I can read ten times more Plato than Aeschylus, I think it must be improving my Greek a lot more. I've pretty much decided now that I'm going to read a lot easier stuff like Plato before attacking difficult texts like tragedy again. How many hours a day did you spend on Aeschylus? I have no idea. I don't work daily, I don't have the time. It's more like 5 hours now, 2 hours tomorrow, 4 hours next tuesday and 4 hours two weeks later. I think you should read as much as you can so that you still understand everything. This is very good advice (although, as in any ancient text, there will undoubtedly be some passages that no one really understands). You will have to work at understanding everything--and that's where dictionaries and commentaries are extremely useful, in my opinion. If you are focusing on Koine Greek, you will be reading a very limited corpus which you probably know in translation almost by heart. That should be a big advantage, although there's risk that you will rely on your preconceived understanding of the meaning and not notice alternative interpretations of the Greek. Again, your time would be best spent reading as much as possible. I question the value of spending large amounts of time and mental effort on memorization, unless you're equipped with a memory that makes memorization instantaneous and effortless. I think you will learn more Greek from simply reading and making sure you understand what you've read as thoroughly as possible. Memorizing 200 pages of Tolstoy won't help you that much with contemporary Russian texts or even Dostoevsky. If you read lots of Tolstoy and Dostoevsky and other texts, however, and make sure you understand as much as possible, you will internalize idioms and characteristic modes of expression. I know from experience. I learned basic Russian--enough to internalize the grammatical forms and basic vocabulary--in a one-year full-time course in the Army, but I took the basic knowledge from that course to a higher level by reading War and Peace and Anna Karenina over the next two years. I didn't rely on memorization, but nevertheless, by looking up every word I didn't know in the dictionary, I greatly expanded my vocabulary and solidified my knowledge of grammar. When I turned to Dostoevsky, though, I still found it somewhat difficult because Dostoevsky's vocabulary and especially his style are completely different from Tolstoy's. Of course, you can listen to Greek while driving in the car, and you can speak Greek to yourself in the shower (προσκυνῶ τῷ Ἰησοῦ. ἄρα σὺ τῷ Ἰησοῦ προσκυνεῖς?) and you can write Greek during a staff meeting while you pretend to take notes. So, I would try to add writing, speaking and listening IN ADDITION to the hour, and spend an hour reading Greek and an hour doing the other three. That is one advantage of supplementing your reading with writing, listening and speaking; you can work these into your day without requiring the full undivided attention demanded of reading Greek texts. We lack objective evidence PROVING that writing, listening to and speaking Ancient Greek will increase your reading fluency, because so few people have tried to do it, and we don't have control groups. But we do know that the reading-only approach has not produced very good results. I'm sympathetic to this suggestion, because, again, I think the status quo of grammar-translation is not working, but, for what it is worth, early on when I was learning Greek, I memorized the Lord's Prayer in Greek and recited it several times a day for several months. You would think that this would have helped me internalize the forms, but, looking back, I don't think it did much good. Maybe memorizing larger blocks of text would have been effective, or maybe different people learned differently, but for me this approach did not work. But, as FDR said about getting out of the Great Depression, "Try something. Try anything." Paul Derouda wrote: I've pretty much decided now that I'm going to read a lot easier stuff like Plato before attacking difficult texts like tragedy again. which I cannot recommend enough. Thanks for the replies, I didn't expect so many replies in such a short time! I havn't really thought much of speaking it, writing it, and listening, that would really cement ideas in my brain much more solidly. As far as memorizing portions of text, I found that this has helped me to learn vocabulary, but did little with syntax in general. Are these the techniques that you use to learn greek Markos? Qimmik wrote: If you are focusing on Koine Greek, you will be reading a very limited corpus which you probably know in translation almost by heart. As far as reading, I read very regularly, and I reread often. I spent my last couple sessions of reading going over Chapter 7 in ΚΑΤΑ ΙΩΑΝΝΗΝ, I've probably read it 7 or 8 times before I felt comfortable moving on to Κεφ 8. In summary, I will add writing, speaking and listening to my repertoire of greek tools. Anyone know of any good Greek audio? I prefer a modern προφορα but find Greeklatinaudio.org to quick to follow along. as long as you are learning then there's no perfect balance of reading vs grammar etc. the way that people dispute the best ratios of protein to carbs for exercise -- in classics it's good to see as much as possible i think, i remember spending hours in libraries opening and flicking through hundreds of books and literally discovering whole new fields in classics to learn about... this variety may itself help with your plateau. when it comes to composition/conversational however, i personally think it's better to ground the exercise itself in real ancient texts rather than just freeform, where you might not know how far you are swerving from the path. for vocab acquisition, i write interlinear scholia in real texts rather than just freeform and looking new words up as i go. for syntax, when i used to spend time on this, i thought the best thing to do was find very literal translations of texts and then translate those translations back into the original language, and then check my version against the original and think about the differences. if you want to do freeform however then i personally think verse comp is better than prose comp -- verse comp has many rules to restrict you to a pattern resembling that used by the ancient poets, the smaller space you are left to work in means you have less risk of deviating from the model texts, and the exercise certainly makes reading verse much easier. I'm skeptical about the utility of listening to spoken Greek. Reconstructed pronunciation is a fascinating subject in itself, but few or none of the recordings I've come across are really satisfying. If reconstructed pronunciation interests you, go for it, but I don't think it will help you much to understand Greek. This is different from living languages, where we know exactly what it should sound like, and where oral skills are usually essential. My advice? Read, read, read! I would like to clarify something, and of course run my mouth some more. I think that the goal for all of us, OP included, is to be able to eventually read the Greek with ease. So the question that I was addressing was how to get to that stage as quickly as possible with a one hour per day restriction. So my view is to memorize a large chunck of text (I think the standard is actually more like 500 pages). This gives the student a huge number of paradigmatic examples ready to hand. (They say classicists would claim to find errors in Schliemann's prose, but he could immediately cite a passage with such a usage.) So, while the "read, read, read" camp sounds like they are having all the fun, don't forget that the tortise beats the hare, and so we Schliemannites claim that we will be able to do more reading, reading, reading in the long run! I don't know about anyone else, but I would never have been able to memorize 500 pages of prose, even before senility set in. Some people may be gifted with the kind of memory that would allow them to achieve such a feat, but I certainly am not. One activity that might be less time-consuming and more productive than memorizing a lot of text would be to spend time preparing a careful written translation of a substantial amount of text. You might even set as your goal your own translation of the entire NT. Location: Between Ilias and Odysseia (ok sometimes Athens). Memorisation: Depends on memory, I have an exceptional one and in the beginning I used to memorise not whole passages but examples of usage from grammars, this could be a happy medium. However the exact same thing can be achieved by paying attention to what you read. Grammar translation: I'm not sure how this is failing, its doing what it means to do rather well: Produce philologists with a firm grasp of the particulars of said language. OBVIOUSLY it needs to be supplemented by reading, if people go to class but then fail to read in their own time and therefore learn nothing that's their problem. But anyway this is not the place for this. Anyway I would suggest the following: Grammatical review, make sure you know all the salient points. Find someway to practice producing the syntax: either in a composition book or going back over a textbook or whatever. Then, here is the main thing, read. Yes make use of a translation if and when you must. Read extensively, you need to do this in order to prepare yourself for any deep reading. It will speed up rapidly. hi, i think it's clear to all of us that pster has already a great command of grammatical and syntactical points, given the threads that pster has started and contributed to, and so i would say go for it re memorising. it has definitely helped me (there are some rare words whose meaning i would never be able to remember without having memorised the slab of text in which i found them) and i'm sure it won't stop pster working on the other aspects of classics. Pster isn't the OP though. You do make an in interesting point with translation in a sense, we're not trained to translate as in the olden days where people could produce wonderful English, French and what have you and I definitely can compose in either language better than translate out of it. But translating back and forth is a good way to check if you have the salient points down, forcing you to really think about it. I also remember a while back having trouble with Virgil. I could read it, parse it, understand it, but there wasn't something I felt I didn't quite *get*. I translated bks 3-6 and by the end of it I felt I had a much better grasp of his style and clearer mental processes from which I could utilise commentaries. Tedious? sort of and no one would ever pay to read my translation but I found it helped. I do agree outside of a class room the hyper traditional methods aren't going to necessarily work, from lack of time, materials and mentorship. Yet I think even those wanting more modern approaches ought to occasionally borrow from these methods since they are still useful. Also, believe it or not, there has been an updating of methodology in the last few decades. ALSO JACT do a reader for the NT, its blue and about 200 pages and well made. Try that? Less dictionary time. @ Qimmik: You have probably memorized 500 songs or poems. You can try memorizing the audio CDs that go with Agamemnon. I still have some verses rattling around in my head from the two weeks I spent on that. @ Chad: It's rare that I don't deserve praise, but this is such an instance. My command of Attic grammar and syntax is poor. I can focus on an issue, but keeping all of it in view is another matter. And the vocabulary and the forms give me endless trouble. It is precisely because of this very deep rut that I am in that I am transitioning to the Schliemann method. I never would have started Greek if I had known how unrewarding it would all be. In fact, I may just declare victory and satisfy myself with the ability to decipher whatever random sentences of Greek I encounter. @ All: N.B., professional translators translate into their native language. That seems to indicate something, but I just woke up, so I'll leave it to you to draw conclusions. I'm in my mid-50's and have been 'doing' Koine since I studied NT Greek at University. I THOUGHT I was pretty good at it. b) when I thought I was reading NT Koine, I was REALLY just using it as an aide-mémoire, because I already knew the English text pretty well. I started seeing all kinds of deeper meanings to the NT words, and the text came alive in a totally new way. I'm currently paddling on the shorelines of Herodotus and Homer, and enjoying it, but my first love is still Koine. If you don't want to mess about with Attic, Homeric, etc, I'd still recommend digging out a few of the Hellenistic novels and working though them. It can be a real blast to find those familiar 'religious' NT words used in their earthy, day-to-day settings. There's some good stuff (and fun reading) in the Oxyrhinchus letters too. I am at the same stage as you. The basic stuff, the article, common declensions is easy because every bit of Greek you read keeps reminding you of them. The hard stuff optative etc is not really hard its just you meet examples rarely so you tend to forget them in between times. The big disadvantage of reading original Greek is that it throws at you a lot of new words and idioms and mixed in is the stuff you sort of half know but and individual form will only occur now and then. As you will be reading slowly it will be a time you encounter again a a bit you want to learn a second time. Hence it will probably help to go over again an again the sections you read rather than trying to read thru something. Well designed textbooks should emphasize some target form in each section. Hence if you have completed one textbook it is worth while trying another as a slightly fresh approach will help consolidation. I find when going back to old exercises in a text book I have completed some while ago I have forgotten them so the exercises are almost as fresh as the first time. On text books I can't resist a plug for Polis Christophe Rico, It's not perfect. A complete beginner would find it very hard (but you're not). He emphasizes different things - hence the aorist imperative is covered in the second chapter. It is lively enough that it is easy to repeat the lessons. It is also in Koine. Translation back into Greek forces you to really get to grips with the language. It is all too easy to wing it and get the gist without truly coming to grips with the Greek you are reading. Remember the plateau is regarded as an illusion. Though on the surface you appear not to be progressing you are still consolidating what you do sort of know. Little and often is better than a lot only occasionally. Hence, it is better to do something you enjoy than to try something that in theory is a good idea and risks you failing to keep up with your one hour a day. The idea is to try to understand the original thoroughly and to attempt to capture as much of the original as you can in the translation. You have probably memorized 500 songs or poems. I probably haven't, but in any case, songs and poems are much, much easier to memorize than prose. Metrical form, rhyme (in the case of modern European languages), unusual use of language, and, in the case of songs, melody make memorization easier. In Greek, as a matter of fact, poetic texts are earlier than the earliest prose texts--poetry was invented, I think, precisely for the transmission by memory of large chunks of information in non-literate societies. But 500 pages of prose? No way. And Schliemann isn't always the most reliable source of information, especially when his own accomplishments are in question. Last edited by Qimmik on Wed Jul 31, 2013 11:20 am, edited 1 time in total. Sorry guys, I havn't forgotten about the post, I'm heading out for work, but will comment when I get home. Thanks for all the replies, I've read them all Sounds like continued reading is a common theme. Certainly can't go wrong. My corpus is mainly NT, however, I'd like to expand a little with some of the early writings as well as the LXX. I'd toyed with the idea of learning an earlier dialect and reading through the Iliad, but I'm a little hesitant. Either way. I've started going through the gospel of John... Easy Greek to keep me motivated... and I'm moving really slow and methodically. So far with this approach, I seemed to have gained a few vocabulary words that I would have glossed over, although I'm finding the syntax often a bit challenging. I suppose "Make haste slowly" seems to be working. cb wrote: ...the best thing to do was find very literal translations of texts and then translate those translations back into the original language, and then check my version against the original and think about the differences. I've done quite a bit of this, using notecards. On one side I copy an Ancient Greek text. On the other side I write out a literal translation that follows the Greek word order and has cues on which constructions to use. Then I try to reproduce the Greek text exactly, and then I flip the card over to check my work. I also use the English as a cue to speak the Ancient Greek. I record the Greek myself and listen to it over and over again. I have no doubt that this is very effective, and I would recommend it to Uberdwayne as part of my advice to write (and speak and listen to) as well to read, Ancient Greek. But the problem with this method (or the traditional comp textbooks) is 1. it's tedious, writing conversational Greek is more fun and easier to motivate oneself to do. 2. these methods still use English, and they wind up reinforcing English glosses for the Greek, and I think at some point it makes sense to transition to a Greek-only learning environment. Markos wrote: I also use the English as a cue to speak the Ancient Greek. Im not sure I understand what you mean by this. Can you elaborate on this? I just mean that I use the over-literal translation to reproduce the Greek text not only in writing, but in speaking it out loud. This is essentially the Assimil Method. It involves active writing and speaking, but this is more "guided" than free-from writing or speaking. Purists will like it because you wind up (re)producing actual Greek texts. I just don't like going through English if I can avoid it. It would be better if you could use pictures as a cue to reproduce Greek, but this would only work with very simple sentences. Markos, why don't you try reading the Anabasis in the unaltered form in which X wrote it? It's really not very difficult, and wrestling with the difficulties it does present should contribute to your mastery of the language--when you turn to more complicated texts you will have to face those difficulties and more. You can find plenty of cheap older second-hand editions with commentaries, some even with vocabularies, as this was the first text that students broached after going through the grammar for a semester when Greek was taught in secondary school. Won't it be more productive for you to engage with the actual text than with a simplified version produced at a time when boys (and almost exclusively boys) started learning Greek around age 9 or 10? You undoubtedly bring much more background to the text than Victorian-era kids of that age. On comparison of the simplified version with the original, the simplified version reads like the sentences of made-up Greek that are found in elementary text-books. It looks to me like many of the characteristic idioms and modes of expression of real Greek--which you will need to master in order eventually to read real Greek (if that's your goal)--have been smoothed out to produce a text that reads almost like a word for word translation from English. In particular, the word-word order has been shifted around, and all the particles seem to have been reduced to men and de. I think you can handle the real thing. Qimmik wrote: Markos, why don't you try reading the Anabasis in the unaltered form in which X wrote it? It's really not very difficult, and wrestling with the difficulties it does present should contribute to your mastery of the language--when you turn to more complicated texts you will have to face those difficulties and more. The choice is between reading a larger quantity of simplified Greek and rather small portion of real Greek. Adapted text allows you to read of lot of stuff you sort of know and by the repetition allows that to become second nature. Reading harder stuff means you can spend a day struggling over a sentence and having sussed it out it will days before you meet the forms that gave you the trouble again. By that time you will have forgotten them. Difficult Greek has the price that you read less Greek - that's the key problem. But like Markos I do read actual Greek - there is an argument for doing both. The Anabasis is very easy Greek, and the unsimplified school editions, which are aimed at less advanced readers, typically provide enough help that those readers won't have to spend an excessive amount of time puzzling over difficulties. But it's more productive, in my view, to spend a little more time confronting real Greek and working out difficulties--which you will have to do eventually if your aim is to progress beyond the Anabasis to Plato, Thucydides or Demosthenes--than to breeze through Greek that has been reconfigured to read more like English. It's worth mentioning that there are several really good student editions nowadays too. At the more expensive end are the Cambridge Green and Yellows produced for upper forms in schools/early undergraduate years which usually offer a wealth of information. Some like Mastronade's Medea probably a bit too much grammatical help and is so rather thick. Besides that you have Steadman and Nimis and Hayes, the JACT readers etc which are really great in the early stages. I think the thing is people don't really read in blocks, which is how we tackle Classical literature: Homer is so much easier when put together with Hesiod and Herodotos, I found most of Tacitus' very easy since I'd read so much of Caesar, Sallust and Livy etc etc. Its a matter of developing reading practices. Anyway I just think "real" texts are easier in the long term but its best to use a mix of materials. Scribo wrote: I remember the first time reading a tragedy, I wanted to kill someone but you get used to it rapidly. Hmm... Because of the Greek, or because of the subject matter...? You mean like "read one book of Homer, then the Theogony, then another book of Homer, then a bit of Herodotus, then five books of Homer...". Doesn't sound like a bad idea to me. Though it's helpful to have a good teacher to make a reading schedule for you, because it's difficult to know this sort of thing before you've actually read the text yourself. Qimmik: You've convinced me to read the Anabasis ASAP. Qimmik wrote: Greek that has been reconfigured to read more like English. What I see as good simplified Greek is something written using only a limited number of grammatical forms and a limited vocabulary. The aim being not simply to make it simpler but to ensure that by repetition those forms etc get fully learnt. Make the Greek less Greek by making it more like the readers own first language is definitely what I have in mind and I agree that kind of adaption is a mistake. 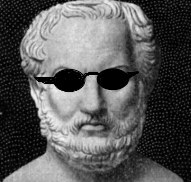 If you want to read something to improve your Greek, I would suggest reading Lysias or Demosthenes. Lysias is probably the next level up from the Anabasis, and it's a substantial but not impossible leap. The speeches are generally written in a very clear style, but they're more demanding, in my view, than the Anabasis. They also offer a window into the Athenian judicial system as well as into Athenian life around the end of the fifth century and the beginning of the fourth--the era of Socrates and Plato--and the way the Athenian "man on the street" thought. Lysias was a metic--a resident alien--in Athens, whose considerable family fortunes were ruined when the Spartans defeated Athens and who was forced to make his living as a logographos, a professional speech-writer for litigants to deliver in court cases. The Athenians didn't allow legal professionals--lawyers and judges--so litigants had to conduct their own cases in front of a jury of several hundred Athenian jurors. (Jury duty was paid and it was a form of welfare for poor people.) So if one party to a dispute wanted to pursue litigation beyond the mandatory arbitration level--if they weren't satisfied with the decision of the arbitrators--both parties had to get up in front of the jury and deliver speeches. If you weren't confident of your forensic abilities, you would pay for a logographos like Lysias to write a speech for you, and you would memorize it for delivery before the jury. The speeches of Lysias (and a few others "Attic orators") were preserved as models of the purest Attic Greek for young Greek students for almost two and a half millenia (but it's not clear which, if any, speeches of the corpus attributed to Lysias were actually written by him). Again, helpful commentaries are available, both older ones in reprint or second-hand and one in the Cambridge Greek and Latin (green and yellow) series. The older commentaries are serviceable and cheaper, but the Cambridge commentary by Carey (I think--the editor of the new OCT Lysias) provides more up-to-date background information, which will be very useful as you read other Greek authors. Sort of both, I've always disliked Tragedy. From a scholarly perspective we have very little of the good ones anyway, what we have is due to luck or Roman/Byzantine interests so I find them sort of...bleh. Also the kind of analysis one sees strikes me as facile and idiotic. Basically the plays themselves often bore me as does the resultant scholarship. Oddly enough though Tragedy did become a very important source for me, which sucked. So yeah like I mentioned we were thrown into Tragedy very early, like second term, because first year Greek was a bloody democracy apparently and apparently we just must read Euripides. Like I said earlier though, I do love his Orestes and Aeschylus on the whole is nice too. Actually I think a lot of my dislike of Tragedy is really just dislike of Euripides. As for the Greek, it was annoying at first until I developed a feel for the register and metre in which case it became easier. But I've never really enjoyed myself with Tragedy the way I have Comedy. That's another thing: Aristophane's Clouds is approachable by anyone with a term or two of Greek. Yeah essentially in blocks, its important that you cover a variety of differing but related styles and so in general ease your way in. I agree its hard to guess without a teacher, actually even most teachers will just give you a list and tell you to get through it. Xenophon: Always traditionally been an introduction to Greek prose. I personally think he can be shunted aside in favour of Herodotos if you're after Epic quickly, but its still good for your Greek. Actually the Anabasis is a wonderful piece of evidence for Greek social organisation and rhetoric. Forensic Speeches: There is also a commentary by Carey and Reid on selected speeches of Demosthenes, definitely worth it. Carey is one of the leading experts on the Athenian lawcourts btw, unlike say Rubenstein or Todd etc he is more literary rather than epigraphically focused which makes his work really interesting. Daivid's response said pretty much everything I would say in defense of adapted Greek. But just as a point of clarification, I am more than capable of reading unadapted Xenophon, and have in fact read quite a bit him, though he is not one of my favorite authors. For that matter, right now I AM re-reading the unadapted Anabasis in conjunction with the adapted edition of Phillpotts and Jerram, because I am very interested in the process of how best to adapt or "level" Ancient Greek, something I have done quite a bit of myself. My Greek is good enough that I routinely read authors more difficult than Xenophon without any helps at all. I can't prove it, but I feel in my bones that my Greek would not be as good as it is if I had never read (or written!) any adapted (or conversational) Greek and did nothing but read "real" Greek using the traditional methods of grammar-translation. For Greek learners at any level--and much more so for beginners--at least SOME of one's reading and listening should be what Stephen Krashen calls "comprehensible input." Ironically, the closest "real" Greek we have to this is probably the LXX, which is influenced, not by English but by Hebrew (which tends to be closer to English than Greek in word order, simple syntax, lack of particles etc) and is therefore easier Greek for the type of rapid internalization of forms that some of us seek in reading and listening to adapted Greek. Qimmik and Scribo, thanks for your tips. My background in Greek is that I've read a lot of poetry, mostly hexameter, but little Attic. A couple of plays by Aristophanes and the Agamemnon and very little Plato is about all I've read in Attic. If a word of what you're saying is true, Xenophon is the closest thing there is to something that reads like a modern book, without constantly looking everything up. Doubtless I can manage something quite a bit more difficult, but I think it would be rewarding to read something really easy for a change after all these years. It's a psychological thing I guess.